BC Truck Outfitters is a company that is passionate about the customization of trucks through high quality aftermarket parts & accessories. They realized that a powerful online presence that could supplement the passion they bring to their job day in and day out had the capability to not only increase exposure, but foot traffic at their automotive parts & accessories retail location. They came to DCi looking to build an eStore Local website that could achieve these goals, and that’s exactly what we did for them. The best part? There was a minimal amount of work required on their end! By providing a service that dynamically populates product information for thousands of parts from hundreds of the top automotive aftermarket brands, it’s easy to maintain an online presence with eStore Local on their side. 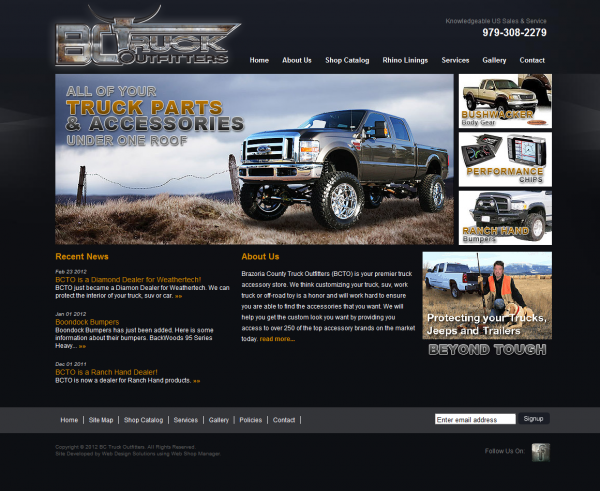 After implementing these features and services, BC Truck Outfitters was on their way to gaining exposure and driving foot traffic to their automotive parts shop.